"41AN2-41, Burial F-2" by Timothy K. Perttula and Robert Z. Selden Jr.
DECORATION: The rim has three engraved ovals. These ovals are comprised of three concentric semi-circular engraved lines, and there are two diagonal engraved lines between each of the negative ovals. The semi-circular lines begin along these diagonal lines. The vessel body has overlapping brushing marks on the body. Poynor Engraved, var. 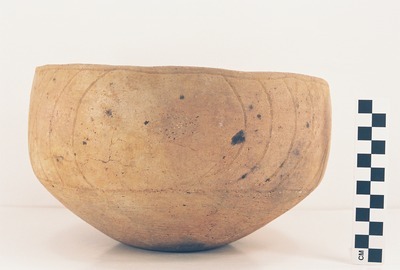 Cook carinated bowl (Vessel 41AN2-41).